Milton Lodge Gardens are mature Grade 2 listed terraced gardens with outstanding views of Wells Cathedral and the Vale of Avalon. There are mixed borders, roses and fine trees. Separate 7 acre arboretum. The entrance from the drive leads past a huge cedar and onto the terraced lawn overlooking the cathedral and the Vale of Avalon, a magnificent view which is repeated from different angles throughout the garden. Below the terrace a variety of trees are underplanted with naturalised spring bulbs and wild flowers which provide a colourful display from March to May. A variety of climbers clothes the south wall of the house above a narrow border of low growing plants. At the end of the house the stone path merges into a grass walk along the uppermost Charles Tudway's four terraces. At the far end steps lead down past a bank of cornus, rose species, abutilons and the white flowered Hebe salicifolia to the small arboretum which forms the western extremity of the garden. With some later exceptions the majority of trees in the arboretum were planted in 1967. This terrace, consisting of a gently sloping lawn bordered on all sides by mixed planting of shrubs and perennials, can be reached through the wall at the eastern end of the arboretum and also down a flight of steps at the end of the stone path along the upper terrace. 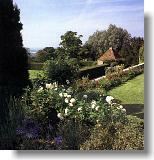 Here old fashioned roses form the basis of the long border beneath the wall. Viewed from either end, this terrace is finely balanced, the long border of shrub roses contrasting well with the simplicity of mown lawn and yew hedge on the other side of the path. At the western end of the sundial terrace steps lead down beside the summerhouse to the swimming pool, set at one end of the large lawn. Low growing shrubs and perennials mingle together in the long border below the yew topped retaining wall. A great oak tree, planted at the same time as the cedar beside the house, shades the eastern end of the lawn and another yew hedge along the southern side masks the extremity of the garden where it merges into the adjoining parkland. Across the Old Bristol Road from the entrance to Milton Lodge car park lies the Combe, a seven acre arboretum and woodland garden which has been developed by successive generations of the Tudway family. It originally formed a natural extension to the garden of the Cedars, the large family mansion in the Liberty in Wells, built in 1760 by Mr Tudway Quilter's ancestor and now forms part of the Wells Cathedral School. The Combe is a natural peaceful oasis on the very edge of the city and is in pleasant contrast to the formal terraced gardens at Milton Lodge across the road. Both share the advantages of interesting topography, fine trees and lovely vistas if the cathedral and surrounding countryside. ½ mile N. of Wells. From A39 Bristol-Wells turn N. up Old Bristol Road. Car Park is first gate on left.